Ngāi Tahu historian Dr Michael Stevens believes his study of Bluff will reshape the way people think about the town’s place in the maritime world, New Zealand’s economic development, and race relations. 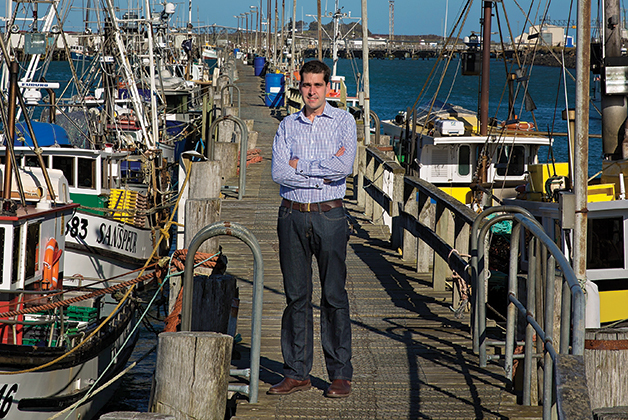 Michael’s bonds with New Zealand’s southernmost com-mercial deepwater port date back six generations on two branches of his family, which includes a multicultural mix of German, Polish, and Ngāi Tahu ancestry. Three generations of his family still call Bluff home, and he can name the day of his next visit, a three-hour drive south from his current home and workplace in Dunedin where he is a lecturer in the Department of History and Art History at the University of Otago. Michael has just launched himself into the most challenging research project of his career to date, writing a monograph entitled Between Local and Global: A World History of Bluff. The title alone hints at the magnitude of the task. Michael was awarded a prestigious Marsden Fast-Start grant of $300,000 by the Royal Society of New Zealand to enable him to research and write a historical case study of Bluff from 1800 to 2000 – a work he believes will reshape the way people think about the town’s place in the maritime world, New Zealand’s economic development, and race relations. Muttonbirding only occupies one or two months of the year though, and Stevens wants to know more about where and how its practitioners have lived in the intervening 10 months over the last two centuries. A big part of the answer, he thinks, is found in Bluff, and other maritime settings. Land was central to New Zealand’s colonisation and this means that historians focus mainly on land-based issues, such as the Crown’s pre-emptive land purchases following the Treaty of Waitangi, the New Zealand Wars, and the Native Land Court. This obscures the maritime threads of New Zealand’s history, and the importance to Māori of maritime spaces and species. Michael says that to this day, about 90 per cent of New Zealand’s imports and exports (by weight) arrive and leave by sea, but very few people realise that. In pre-colonial days, Bluff was a place where southern Māori visited and worked stone, but when European sealers began visiting southern New Zealand, numerous Kāi Tahu people arranged themselves in small settlements along both sides of Foveaux Strait. Ruapuke Island was a key site of cultural encounter. A lot of early contact with European sealers, whalers, and traders was initially focused on this island. It was a place where ships anchored, people met, and goods and services were traded. Small interracial settlements then emerged at the likes of Whenua Hou (Codfish Island), Riverton, The Neck, and of course Bluff. At the time, Foveaux Strait was one point in the “Tasman Triangle” that connected Ngāpuhi in the Bay of Islands with southern Kāi Tahu and Port Jackson (Sydney) in New South Wales. That shipping link brought a tide of multicultural influences from all over the world – escaped or former convicts from Australia’s penal colonies; sealers and whalers from Britain, Europe, and America; Aboriginals, African Americans, and Native Americans, to name a few. After New Zealand became formally incorporated into the British Empire, Bluff became increasingly important as the focal hub of the region, as a shift occurred away from an extractive maritime economy based on seals and whales to an agricultural-based economy. Small pre-colonial settlements around the shores of Rakiura and Foveaux Strait were then abandoned as people were drawn to Bluff where infrastructure was established to handle key goods. Michael says it is significant that these people didn’t move to larger, inland settlements, but instead chose to remain in coastal settings. By the 1860s Bluff was the main feeder port for the Southland province, with settlers, livestock, and goods pouring in and cargoes of oats and wool exported out. The discovery of gold in Central Otago brought gold-diggers flooding into Te Waipounamu, with Bluff second only to those arriving through Port Chalmers. Dr Steven’s German great-great-great-grandfather, Joseph Metzger, arrived in Bluff in 1872 and, among other things, eventually established a chain of fish-receiving sheds around Foveaux Strait. He then froze fish down in Bluff’s cool stores and exported it to Melbourne. He married a German-speaking Polish woman and had a large family, laying the foundations of a commercially successful business dynasty that eventually moved on to other commercial ventures throughout New Zealand. Stevens’ great-grandfather, Nick (The Fox) Metzger, married into a Māori family descended from one of the original European founders of the Moeraki whaling settlement, William Isaac Haberfield, and his wife Teitei. Today the only Metzgers remaining in Bluff are those with the Kāi Tahu connection. Through this whakapapa link, his family has maintained the Kāi Tahu tradition of muttonbirding on their small tītī island, one of 36 islands in the Tītī Islands group. It is an important social tradition for Michael and now his own children to spend time with his grandfather Graham (Tiny) Metzger, who has been influential in passing on traditional cultural practices of preparing and preserving the birds using pōhā. Michael has only ever missed a couple of birding seasons when he was a student. Michael believes there is something unique about Bluff. The town has maintained a robust population of Māori families whose connection to the region spans centuries, and hinges on their ability to survive and adapt to change. In much of his PhD thesis, Michael told the story of muttonbirding through successive generations of his own family, not because they were special, but because they were representative of many core Kāi Tahu families from southern New Zealand. He believes there is something unique about Bluff. The town has maintained a robust population of Māori families whose connection to the region spans centuries, and hinges on their ability to survive and adapt to change. In the 2006 census, 43 per cent of Bluff residents self-identified as Māori, statistically surprising considering only 11.8 per cent of Southlanders and 15 per cent of New Zealanders claim the same connection. It is one of few places in Te Waipounamu where large numbers of Māori families actually live close to one of their marae. 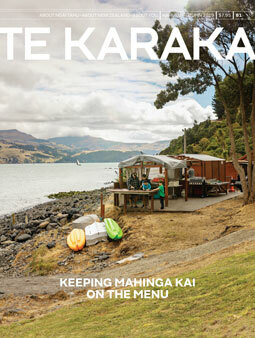 Many families maintain a lifestyle that revolves around the seasonal collection of mahika kai, traditional resources like tītī (muttonbirds), tio (oysters), and other inshore fisheries. “Bluff was an industrial port, so people with a love of the sea stayed because there was work here for them as wharfies, fishermen, oystermen, and freezing workers; but they could also more easily go muttonbirding and maybe hunt feral pigs and deer, or run a few sheep on some land. Bluff allowed them to do that,” Michael says. This lifestyle pattern persists. Recently it was estimated that more than 70 per cent of skippers and crew of all vessels working out of Bluff are Kāi Tahu, or are married to a Kāi Tahu person. By the 1960s, Bluff was the largest exporter of frozen mutton and lamb in New Zealand, substantially due to the Ocean Beach Freezing Works, established on the town’s outskirts in 1891. This company attracted a huge influx of North Island Māori, but it also ran a special chain for muttonbirders to start earlier and finish earlier in the season than their colleagues, thus allowing them to work both seasonal jobs. The town’s population peaked at about 3000 in the early 1970s and has declined to about 1800, partly due to containerisation of cargo and the closure of Ocean Beach in 1991. Many Bluffies have moved on, but often to other ports like Port Chalmers, Timaru, Lyttelton, Picton, and Nelson, where they have found work on the wharves, on fishing vessels, or in fish processing. In other words, they have sought to retain their old lives rather than escape them. Several months into his research, Michael is in the “archival smash-and-grab” stage of a project that is strongly archive-based. He has a research assistant to help with the research. Besides the Hocken Library in Dunedin, which is a key source of information, he has plans to visit Wellington, Sydney, London, and Edinburgh to dig through records from the likes of the British Admiralty and the Colonial Office, and The National Archives. Michael does not think that “bicultural” approaches to history give a full picture of the Māori past, and says the project offers him an opportunity to re-cast it in new ways. He hopes that his research will help people to understand the long-standing multicultural influences on towns like Bluff.